Deep Cheeps (originally parsed Deep-Cheeps) are a special variety of Cheep Cheeps that are first found in New Super Mario Bros. They appear to be regular Cheep Cheeps, except for the fact that these creatures are green and will swim in the direction of Mario or Luigi in underwater levels depending on the direction they swim in. Deep Cheeps will only give up pursuing Mario or Luigi provided the latter ones swim behind and past the fish foes. Three Deep-Cheeps in New Super Mario Bros. In New Super Mario Bros., Deep-Cheeps and their larger variants, the Mega Deep-Cheeps, only show up in World 6-5. They chase Mario or Luigi until the heroes swim away. In New Super Mario Bros. Wii, Deep-Cheeps are slightly more common. One appears in World 1-4 along with a Mega Deep-Cheep. If Mario and co. keep staying in the area, another pair of green fish enemies appears. Deep-Cheeps can also be encountered in the second part of World 8-4. In this game, their lips have become pink, matching the current depiction of a Cheep Cheep's, rather than keeping the red-orange colored lips they and Cheep Cheeps previously had in New Super Mario Bros. Their dorsal fins and tails have also become yellow, as opposed to white. There is a more relentless enemy similar to Deep-Cheep known as Spiny Cheep Cheep. Deep Cheeps reappear in New Super Mario Bros. 2, behaving and looking like they did in New Super Mario Bros. Wii. Deep Cheeps first appear in World Mushroom -2. Though Deep Cheeps do not appear in New Super Mario Bros. U (despite them receiving official artwork for that game), they still appear in New Super Luigi U, behaving the same as in previous games. Their only appearance is in Cheep Chomp Chase. Deep Cheeps reappear in Super Mario Maker and Super Mario Maker for Nintendo 3DS. They aesthetically replace green Cheep Cheeps and Blurps in the New Super Mario Bros. U style, except that they no longer chase the player due to the green Cheep Cheeps and the Blurps from other styles not being able to chase Mario. Furthermore, the voice heard when placing Deep Cheeps onto the course just calls them Cheep Cheeps. In Mario Party 9, a Deep-Cheep can be seen swimming around Blooper Beach. It jumps out of the water at various intervals and may even jump over the player's vehicle. It has no effect on the gameplay. In Yoshi's New Island, Deep Cheeps appear as obstacles in Submarine Yoshi sections, replacing Piscatory Petes from previous games. Rather than swimming in the direction of the player, they swim in a wide wave pattern contrary to red Cheep Cheeps, which simply move forward. Like the original New Super Mario Bros., their faces do not have an angered expression. Furthermore, the official Japanese guide simply considers them to be generic green Cheep Cheeps. In Super Mario Bros. 3, green Cheep Cheeps simply swim back-and-forth in shallow bodies of water, and as such are less aggressive than the red ones of the same game, unlike Deep Cheeps. In the Super Mario All-Stars and Super Mario Bros. Deluxe versions of Super Mario Bros. and Super Mario Bros.: The Lost Levels, green Cheep Cheeps replace grey Cheep Cheeps; the "orange and grey" palette in the originals actually occupies the same hardware space as the "orange and green" palette, as demonstrated by World 9 of the latter. Mr. Kipper from Super Mario RPG: Legend of the Seven Stars, a stronger variety of Cheep Cheep (referred to as "Goby" in this game), is shown to be green out of water, but appears purple while underwater, like the Cheep Cheeps of that game. In Super Paper Mario, green Cheep Cheeps, found in The Tile Pool and the Gap of Crag, behave just like their red counterparts, found in Gloam Valley, but always appear fully-submerged, while the red ones are typically right under the surface. They both have the same stats, and the green ones are the one present on the Cheep Cheep Catch Card. Green Cheep Cheeps were going to reappear were going to appear in Paper Mario: Color Splash, as they have graphics in the data, but they are unused in the final version. Deep Cheeps were also unused in Paper Mario: Sticker Star. ↑ von Esmarch, Nick. 2012. New Super Mario Bros. 2 PRIMA Official Game Guide, page 24. ↑ Loe, Casey. New Super Mario Bros. Official Nintendo Player's Guide, page 12. 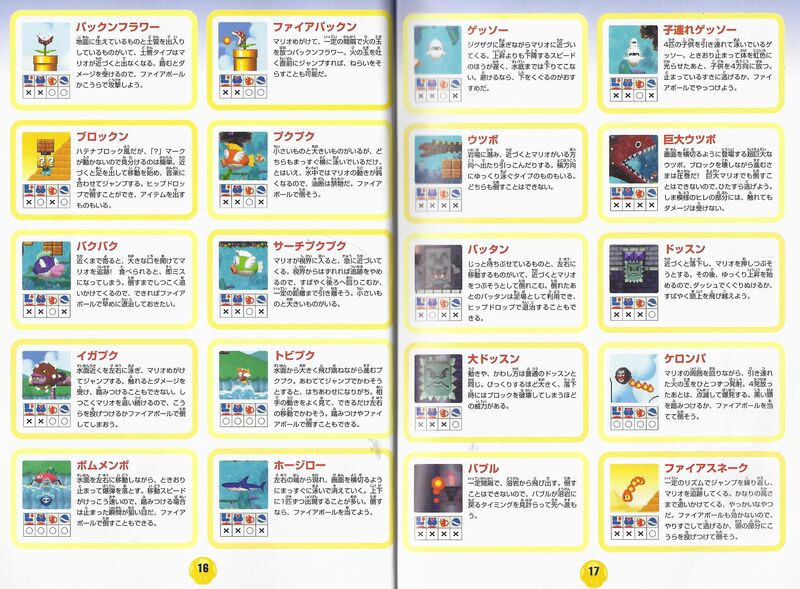 ↑ ヨッシー New アイランド 任天堂公式ガイドブック」 (Yoshi's New Island Nintendo Kōshiki Guidebook), page 24. 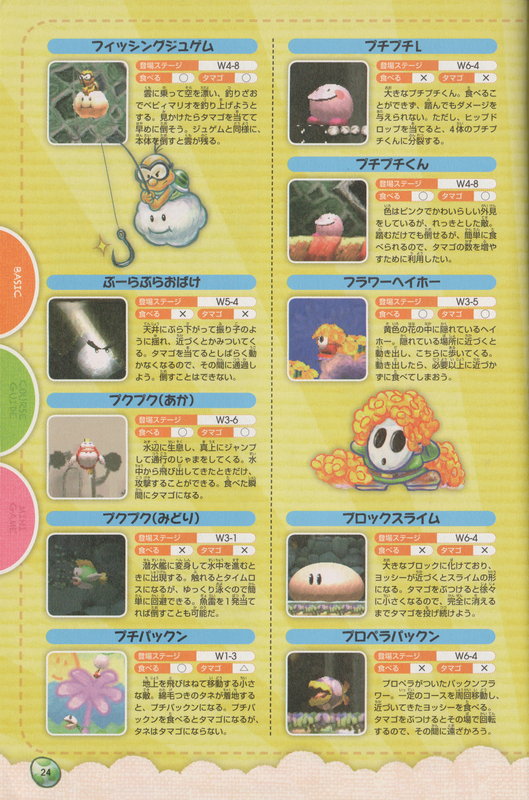 ↑ 「ヨッシー New アイランド 任天堂公式ガイドブック」 (Yoshi's New Island Nintendo Kōshiki Guidebook), page 24. This page was last edited on April 13, 2019, at 00:34.